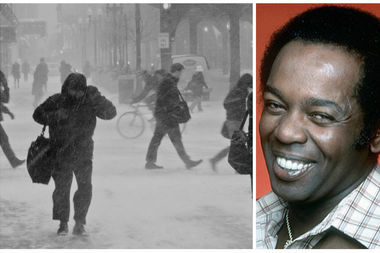 Bronzeville native Lou Rawls' 1967 song, "Dead End Street" describes the cold winters in Chicago. The Block Club is DNAinfo Chicago's blog. It's a place for fun things we see on the internet — or in the neighborhoods. Feel free to loiter. The "Hamilton" creator said "Almost Like Praying" was inspired by "Maria" from "West Side Story." Trump Tower did not exist in 1984. Also the scene takes place in what would be the middle of the lake. Getting a perfect picture has become more important than real conversation, the former president said. Meghan Markle, the prince's girlfriend/rumored fiancee, is a Northwestern alumna. Chicago Police have a list of safety tips for Halloween. He's not the musical guest though. That's Eminem. Want to look like the famous horror show host? Here's how to do it. Fake Facebook events centered on the Bean are hilarious and possibly a sign we all need a vacation. Stage visit comes on singer's 33rd birthday. The basketball superstar is getting married to Amanda Clifton Nov. 3. "This is some super weird street art, and I was wondering if you knew what was going on," a reader said. Mulligan School Apartments will be one of three structures in Lincoln Park honored Tuesday. Sign up for our Block Club newsletter!